As discussed in these astrobites, protostars are formed by the collapse of a molecular cloud in the interstellar medium. But the observed specific angular momentum of one of these molecular clouds is typically significantly higher than that of the protostar that is born out of it (up to four orders of magnitude higher, according to one study!). Without some means of slowing down, all stars would be spinning at or near break-up velocity — the speed at which the centripetal force is equal to the gravitational force and the star is unable to hold itself together. This leads to one of the unsolved problems in the physics of star formation: how do protostars brake? Magnetic fields are an attractive option for angular momentum transfer. 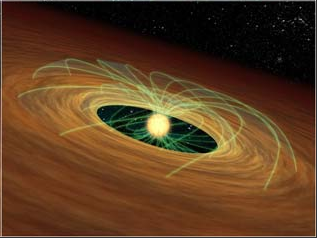 As an example mechanism, field lines that connect the protostar to the protostellar disk could exert magnetic torques that slow the star down (see Figure 1 for an artist’s conception). But while magnetic effects may resolve the problem for low-mass stars, high-mass stars and Population III stars are likely to be less magnetized, requiring a separate explanation for how they brake. In this paper, the authors suggest that gravitational torques exerted on the protostar by the disk might instead be the answer. The authors perform simulations of the self-gravitational collapse of an isothermal cloud using ORION, an adaptive mesh refinement code. These simulations follow the formation of a protostar and its associated disk, and study the evolution of the system as the protostar deforms. The authors then observe the effects of gravitational torques from the external disk on the now non-axisymmetric star. Two particular cases are observed in this study: in Case 1 the authors consider initial conditions which lead to a large disk-to-star mass ratio, and in Case 2 the initial conditions lead to a small disk-to-star ratio. Figure 2: Log plot of the density (normalized by the star density), at four different snapshots during the initial collapse in Case 1. The dark line indicates where rho = rho*. Figure 1 in the paper. 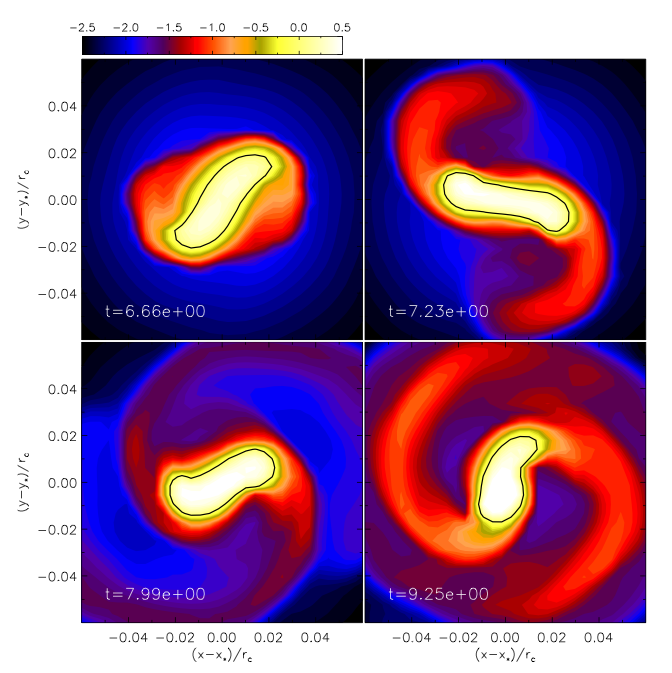 The authors find that, as the protostar spins up due to accretion, it deforms into a bar-like object (see Figure 2). As a result, it exerts a gravitational torque on the disk material, producing spiral arms within it which then exert a torque back on the star. The star ultimately approaches a steady-state configuration in which the spin-up due to accretion is balanced by the spin-down due to gravitational torques. The authors note that the steady-state speed is limited to approximately 50% of the break-up speed of the star — suggesting that this is indeed an effective mechanism for braking stars during their formation. The authors also observe that the more-massive disk in Case 1 is less efficient at spinning down the star than the less-massive disk in Case 2, due to different azimuthal spiral modes dominating the transport of angular momentum. The disk in Case 1 is dominated by the one-armed m=1 mode. Because of the lopsided nature of this mode, the disk behaves like a binary companion to the star, inducing large orbital motions of the star as it orbits the center of mass of the system, but not changing the star’s spin very effectively. Conversely, the disk in Case 2 is dominated by the two-armed m=2 mode, which does effectively spin down the system. The paper concludes by noting that this gravitational-torque limit could have an interesting implication for stellar evolution: the limit to the spin rate might prevent strong rotational mixing — which can allow the star to bypass the red giant phase — from occurring in stars. Thus the limits found in this paper could be used to impose further constraint on stellar evolution calculations. Thanks for mentioning this work on astrobites!